The X3 begins arriving in U.S. showrooms late this year with customer deliveries starting early next year. LOS ANGELES (Bloomberg) -- Volkswagen AG's Audi doesn't think U.S. sales of its Q5 SUV will be hurt by the launch of BMW's second-generation X3 SUV. The X3 begins arriving in U.S. showrooms late this year with customer deliveries starting early next year, according to BMW. Sales of the Q5 through October rose 77 percent compared with last year to 18,735, according to Autodata Corp., a Woodcliff Lake, New Jersey-based researcher. Audi has a 12-day supply of the Q5 and the company could sell 1,000 more a month if they had more vehicles, de Nysschen said. 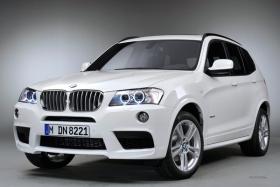 BMW started selling the first-generation X3 in 2004, exploiting a market for a small, upscale SUV. It has since fallen behind in the segment with sales so far this year falling 2.7 percent from last year to 5,135, according to Autodata. “It's likely we'll see the segment really grow to naturally accommodate whatever plans our BMW colleagues have,” de Nysschen said.